The Bull engine is named after the Cornish engineer Edward Bull, a friend of Richard Trevithick. The Bull Engine at Kew Bridge was built by Harvey & Co in 1856, although it was not put to work until 1859. 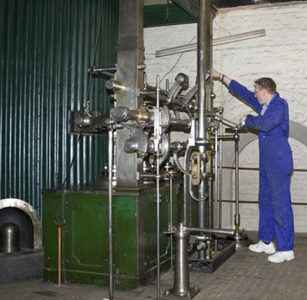 A Bull engine differs from a traditional Cornish beam engine in that the steam cylinder is inverted over the pump and thus dispenses with the need for a main beam. This design meant that a Bull Engine took up about half the space of a beam engine of similar pumping capacity and makes the engine safer to operate. The engine has suffered substantial wear through its working life, which resulted in it being one of the first engines to be retired at Kew Bridge. 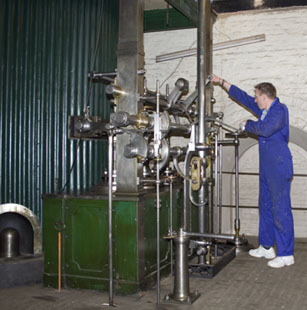 Ours is the largest known surviving Bull Engine, and the only one in its original engine house. When running, the engine is the only working Bull Engine in the world. The Bull Engine has been restored by volunteers of the Museum. After a seven year programme, the work has now been completed and the engine was returned to steam on 12th May 2008.